Today we’d like to introduce you to Jayne Edison. Jayne, let’s start with your story. We’d love to hear how you got started and how the journey has been so far. Since its creation in 1999, OFI’s success has been a classic example of the importance of a small company projecting a big company image and attitude. 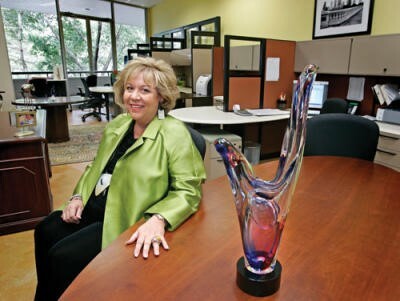 In charge of the commercial office furniture division for an office supply and furniture company, Jayne had been collaborating with a design firm for two years on supplying furniture to the new Harris County Criminal Justice Center in 1999. But just as the company she worked for was about to make a bid, it pulled the plug. That’s when the manufacturers Edison had been working with on the bid suggested she take on the project herself. Edison says they even offered to help finance her initial business expenses. The manufacturers supplied her with a 12-month, interest-free start-up loan and, within six weeks of OFI being up and running, Edison had landed the $4.5 million Harris County Justice Center project. OFI was on its way, but competing with the big-name furniture companies was going to be an uphill battle. For the first four years, Edison ran the business from a closet at her home — something her competitors never failed to bring up when vying for a job, she says. But Edison stuck to her plan and, with the help of a small but dedicated staff, quickly learned the importance of creating a successful image for her company. But image means little without the results to back it up. Edison attributes OFI’s reputation as a reliable business partner to her staff, who she describes as “an office full of leaders.” She says her management style is hands off; that a good leader will trust her employees to know what to do when problems crop up. Crafting the image of a confident, forward-thinking company is crucial to growing your business in an extremely competitive environment, Edison says. When trying to land bids against larger companies with a vast amount of resources, Edison says, entrepreneurs often have to take risks and be willing go to extremes to ace that first impression. One such example was when OFI was competing to supply office furniture to Houston’s new Federal Reserve building on Allen Parkway. The project’s architect was well-known New York-based Michael Graves, who also happened to have a line of housewares carried by Target stores. Told by Graves’ firm that OFI was the smallest company competing on the project and that it probably was not going be in the running, Edison decided to get creative, cleaning out the local Target and stocking her temporary showroom with Graves’ wares. Conscious of the bottom line, though, after the mock-up process was over, Edison returned almost all the purchases to Target. “We didn’t have $1,000 to spend doing all these things,” Edison says. “But that’s what set us apart from our competitors.” The effort paid off and OFI was awarded the job, The Federal Reserve Bank on Allen Parkway in Houston, a Michael Graves Project a 650,000 Sq. Ft., from her closet. Edison says her drive to see OFI succeed and prosper comes from both a competitive and entrepreneurial spirit. Growing a $15 million company out of your closet isn’t easy, she adds, but with the right attitude it’s definitely possible. Today Ofi in its partnership with MCA is in a 12,000 Sq. Ft. showroom, branded as EnterAct. The view is 360 degrees of the Houston Skyline. A long way from the closet where she pushed her high heels over and started OFI. All businesses face challenges let’s be honest. From these challenges come growth and new visions!!! In 2012 I met an amazing man, Rick Cortez President and CEO of MCA Communications. We brain stormed by the trash can…true story…and a new showroom was born…Enteract!!! A design lab full of the latest in office furniture and technology. EnterAct is a collaborative design lab driven by MCA Communications and Office Furniture Innovations. The only showroom of its kind in Houston and the State of Texas, it features the latest in office technology and furnishings in an interactive and educational setting. EnterAct is more than just a showroom. It provides companies with a unique opportunity to experience office space solutions first-hand and how to integrate technology and furniture to make the most of their space. Alright – so let’s talk business. Tell us about Office Furniture Innovations – what should we know? Founded in 1999, Office Furniture Innovations (OFI) is a premier office furniture dealer headquartered in Houston, TX. As a full service firm, OFI specializes in providing solutions for workspace environments through strategic planning, project management, installation, asset management, maintenance and liquidation. Utilizing the over 100 years of combined experience, the management team is able to lead easily through each project and keep the philosophy consistent, partner with clients to meet their business goals.